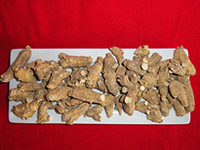 All products sold through the GHC are certified 100% Wisconsin Ginseng. 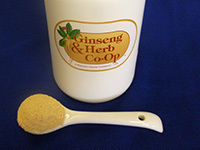 The GHC has the right to use the Wisconsin Ginseng Seal; a decade old program meant to help consumers identify products with pure Wisconsin Ginseng. Packaged products bearing the official Wisconsin Seal® must contain 100% pure Wisconsin Ginseng, grown and harvested in Wisconsin. 3 year mixed grade- $128/ lb. Mixed grade ginseng in variety of sizes naturally occurring in 3 yr old field. 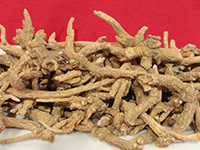 Uncut ginseng roots are sorted to remove blemished roots and root hairs. For wholesale purchases of 125-150 lb barrels, which include all root components, please call (715) 443-3355 for current pricing and availability. 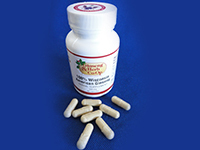 500mg veggie capsules, 60 count per bottle. Used in the Mayo Clinic Pilot Study. $17 per bottle. $15 per bottle for purchases of four bottles or more. 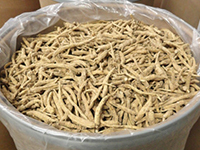 Pearl ginseng roots are cut and graded by diameter. They are generally thicker than their short counterparts. Newly designed 4oz and 8oz packages, ranging in price from $70 to $175. 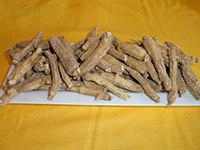 Short ginseng roots are cut and are graded by diameter. They are generally less thick than their pearl counterparts. 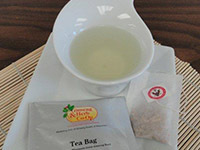 Newly designed 4oz and 8oz packages, ranging in price from $45 to $115. 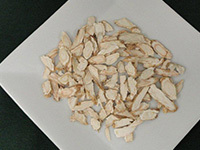 Sliced ginseng roots. Convenient for cooking and great for snacking. Priced from $60 to $110.